Sales of passenger vehicles grew at their slowest pace in five years in the just concluded fiscal year as higher insurance costs, a liquidity crunch and uncertainty ahead of the general elections hurt consumer sentiment. The sector grew by less than 3% overall to around 3.3-3.4 million units, industry estimates suggest, despite deep discounts offered by car makers to counteract the slowdown. 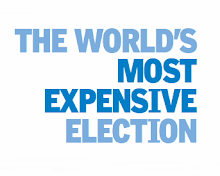 Automakers, however, expect sales to perk up once election results are announced in late-May. 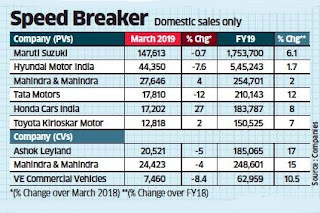 Maruti Suzuki’s domestic sales declined marginally to 147,613 units last month, as sales of entry level cars such as the Alto and Wagon R dropped about 55%. However, sales of compacts such as the Swift and Baleno, midsize sedans like the Ciaz and utility vehicles showed growth rates in the mid- to high-teens range last month. In the last financial year, the company’s wholesale volumes shot up 6.1% to a record 1,753,700 units, its seventh straight year of growth, buoyed by strong gains during the beginning of the fiscal. Hyundai Motor India sales fell 7.6% from a year earlier to 44,350 units last month, although sales for the fiscal year grew 1.7% to 5,45,243 units. At Tata Motors, local sales dropped 12% in March to 17,810 units. For the fiscal year, however, the numbers were up 12% at 2,10,143. Launches of new variants, coupled with healthy discounts, helped attract more buyers in March, although the overall business environment remained tough. While Maruti Suzuki offered savings of up to ₹30,000 on the top-selling Vitara Brezza model, the discounts were around ₹33,000 on the Ignis and up to ₹50,000 on the Alto800, AltoK10 and Celerio models. South Korean rival Hyundai Motor India gave discounts of up to ₹75,000 on the Grand i10, and up to ₹50,000 on the Elantra and Tucson, while Tata Motors offered price benefits ranging from ₹59,000 to ₹105,000 on the Hexa, Nexon, Tiago and Tigor models. Toyota too extended benefits of up to ₹134,000 across a range of models. Sales at Toyota rose 2% last month, while volumes were up by 4% in the same period for Mahindra & Mahindra. Honda Cars India sold 27% more vehicles in March.